View all products by Parasol Co. Compare the feel of a Parasol diaper to your current diaper and you'll see what they're talking about. This is the softness your baby deserves. 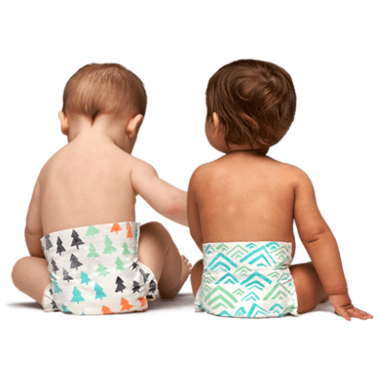 Their diapers use fluff pulp harvested from sustainably managed forests - they are hypoallergenic, chlorine-free, fragrance-free, lotion-free, latex-free, and free of lead and heavy metals. Their diapers go through rigorous performance testing so you can trust your Parasol diapers are highly absorbent, effective and comfortable for your baby -one diaper for both day and night use. Gentle, latex-free and hygiene-grade elastic keeps a comfortable fit around your little one. It's also high rise and full back coverage. Good for overnight use. Keeps your baby's skin drier and happier. Safe and lead-free inks capture the beautiful, hand-painted brush strokes of artist Ashley Goldberg. I'm not a fan of the fit of these diapers. They are shorter compare to Seventh Generation or The honest company. I almost always have leaks with both my little crawler and my toddler... I'm really disappointed with those diapers. Love the ingredients and design is so cute! 4/5 because they could be softer. These are the best diapers. Very clean and gentle on the skin, no bulk and no leaking! Love these diapers! So soft, no leaks, adorable and safe! These diapers are great! They're just as cute as the Honest Company's but I find them to be much softer (they're SO soft!). They're very wide, very absorbent, and we've had very few leaks with these. No scent, which is perfect. 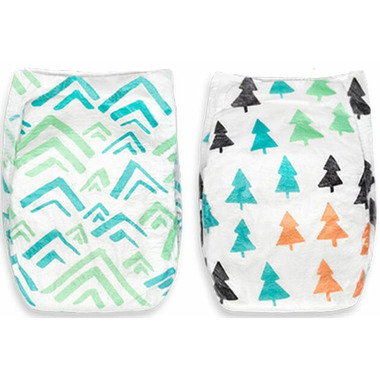 Absolutely love these diapers - they are soft and fit great on my chunky toddlers legs. They are a bit pricier than your average grocery store brand but they are worth it! These are very cute and definitely soft, but they are quite thin and don't absorb as well as the other eco-friendly brands. They also smell more. Absolutely love this brand of dispers. My son sleeps 12 hrs overnight and these are the only natural diapers that I have found that last through the night with him. They are so soft so it helps with his sensitive, eczema prone skin too. I just wish they weren't so expensive. I do usually get them on sale, but as he grows and goes up sizes- you get less diapers for the same amount of money. I do love them tho, so the price is worth it to me. The designs and how cute they are are just an added bonus. I do wish that you could get the wipes and the training pants from this brand on well.ca too. I bought these diapers because they were eco friendly, and on sale. I love the designs, and the softness; however, they definitely feel wet, and don't seem to absorb as well as the honest diapers. I will only use these during the day. Bought these recently as a trial (yay sales!) and really liked them! They were so soft, similar to seventh generation in absorption in my opinion. But they are just the sweetest designs, quite happy with them, but not sure if we will get many more because we have found other eco friendly options that absorb better (but are less soft!). These are so super soft! Honestly, I would do all five stars, but they do feel a bit wet when changing the diapers. Not using these for night time, but if you can change them more often during the day, then they are totally awesome! Size 1 worked perfectly for my 8lb 7oz newborn. We had zero leaks and he is one month old now. The material is nice and soft, thin, not bulky and the price is fair for this product niche. At first I was put off that there was not a wetness indicator but a simple pinch test (if the diaper feels squishy) works just fine . Great diapers, best eco friendly option I've tried so far. They're ultra soft and fluffy for baby's bum yet really absorbent. We have tried seventh generation diapers, honest co. and now these. I found parasol to definitely be the softest, most underwear-like feeling diapers however their absorbency isnâ€™t quite as good as I had found SG or HC to be. My favorite diapers by far! They are soft, form fitting, not at all bulky, and I have only had two leaks in one month. I am happy I found these and will definitely buy again. While these diapers are soft and cute, they do not seem to absorb quickly enough for my fast and heavy wetting 4 month old. If he is laying down, we get leaks out the side or back of the diaper every time. If he is upright they work well. I like the materials used, but prefer the Honest diapers when it comes to performance. Best diapers out there! Iâ€™m sure if my lil guy could, he would thank me for buying these diapers. They are hands down softer, more comfortable and yet more absorbent than any other diaper out there. They are definitely in a class of their own. Soft. No leaks. Fit Big (compared to Honest Co.) When wet, they feel heavier/bunchier (compared to the soft fullness of the Honest Co). Great fit, beautiful designs. The most efficient and absorbant "green" disposable diapers I've tried so far. Great fit. Lots of room for messy poops without looking bulky. Absolutely love these diapers! No leaks, even use them for night time and last 10 hours leak free. Super soft, definitely worth the extra money! LOVE these diapers. I got one pack to try as I usually use Honest brand diapers and loved those. However, after traveling with a baby, these are now my new favorites. We used Honest on the flight over (6hrs) and did a change before the flight and 2x during the flight. Both times during the flight the Honest diapers leaked and we had to do outfit changes for our baby. And then after we landed, baby pooped and sure enough, ANOTHER leak and outfit change. I'm not sure why it happened so often as I hadn't had issues with Honest before. On the flight back, we used Parasol, changed before the flight and 1x during. Absolutely no leaks/blowouts. Parasol was also noticeably softer and didn't bulge up that much when soaked. The only thing is that it's definitely bigger than the same size in Honest brand, so sometimes a bit bulky looking. But I'll take that over leaking and blow outs any day! Really like this diaper. Cute design. Delicate on the skin. Haven't had trouble with leeks. Cute prints, fairly soft against the skin. However, when soaked (around 2 hours for my heavy-wetting newborn) the diaper swells and creates gaps by the legs, causing leaks. Likely just an issue at the smallest size, but annoying enough that we probably won't buy again. Soft and absorbent. Iâ€™m not sure they are the SOFTEST, as other reviewers have said, but these are a very good diaper. Lasts 12h overnight, no perfumes, doesnâ€™t irritate babyâ€™s skin, good fit, cute prints. I wanted to like this brand because I have read so many positive about it. So I bought the size 4 during one of the sale event on well.ca. The pros: Yes, the diaper feel softer and thinner than the other brands I have tried before. No rash either. The cons: The outer material sticks to my son's pants and created lint every time I changed him. My son is a heavy wetter and when full of pee after a couple of hours, the diaper looks like it's going to explode. I give 3 stars for the cons. Maybe it works for others but certainly not for my son. Love these diapers, everything stays in the diaper, no more blow outs = amazing. They are super soft and great for my little one, as he no longer has a diaper rash since I have switched to this brand, happy little = win. Elle laisse Ã©chapper un peu d'humiditÃ© quand il y a des pipis. On le ressens Ã travers le pyjama. De plus, comme il n'y a pas d'Ã©lastique dans le dos, il y a eu des dÃ©bordements. Elles sont belles par contre et Ã§a fait changement du petit blanc. J'aime beaucoup qu'elle n'est pas d'odeur lorsqu'elles sont pleines. Love these Diapers, they are super soft and work well as an over night diaper. Been trying out multiple brands of diapers for my little one, so far the most reliable (no more explosion yay!) and softest one in the market I can say. The diaper is very absorbent that it can last through the night and unlike some other brand, it doesn't give you a red irritated bum. Highly recommended to babies with sensitive skin! 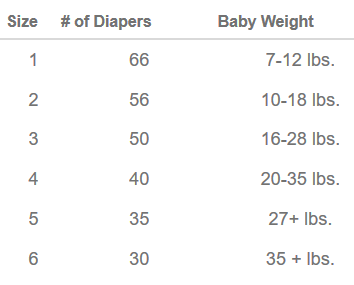 Let me start off by saying I researched diapers before my little one arrived and I had slew of variety to see which I would like more. When I went to the hospital I ONLY brought Parasol Co.! Not only are these SERIOUSLY the softest diapers I have ever felt, my little one to this day has NEVER had a diaper rash...I'm not even joking. Another thing we have never experienced, are these so called "blow outs". The coverage and absorbency is phenomenal. Literally, sometimes we think after a #2 that if he was in ANY other diaper there would be one serious mess! We love the diapers, the prints, the softness, coverage and absorbency but we also love what this company is about. Eco-conscious, super safe and none of that toxic stuff you don't want touching your babe! Highly, HIGHLY recommend. To note how much we love these, we were shipping these to Buffalo and crossing the border so we wouldn't have to use any other brand! Thank you Parasol for coming to Canada! Our baby has been a Parasol baby since the moment he joined us earth side in the hospital! We love Parasol not only because they are seriously the SOFTEST diaper, our little one has never had a diaper rash...yes you read that correct. Another thing we have never had is a diaper blow out!! We hear all these stories yet never experienced one! Thank you Parasol. These diapers are a great size, have great coverage and absorbency. If youâ€™ve been debating on a diaper brand this is it! Your baby will thank you! We canâ€™t live without our Parasols!